Tales about enchanted jewellery: First sale on Etsy! 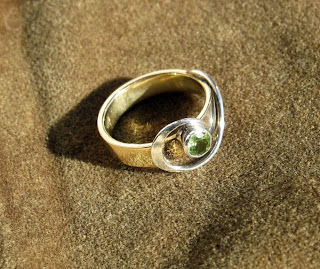 A beautifull 14 k gold ring with a swirl of silver tugging a facet cut peridot. The buyer was a gentleman in the States and I shipped it off Friday as registered mail. A bit of a hassle, as it turns out, and I definitely have to adjust the shipping costs on Etsy. It cost me 90 kroner, which is apr. 18 dollars! However, I see it as learning money and am just very happy indeed to get this baby flying. Hopefully soon others will find my jewelry equally interesting and start buying it! My first shipment arrived at the customer!